AMAZING VIDEO SHOT OF UFO AT WORLD TRADE CENTER PRE 911! REAL VIDEO OF UFO AT WTC PRE 911! The video below is the most amazing video ever taken of a UFO! It contains a UFO sighting at the World Trade Center July 24th 2000. One year one month and 18 days before 911 occurred. 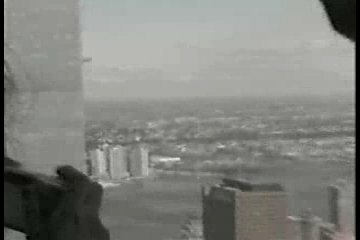 The UFO eerily hangs near the World Trade Center at the impact spot where the second jet was caught on film hitting the towers! This has appeared on several sites in a nice quality .mov file. We've done more analysis than you can imagine on this 19 second clip. Hi Resolution scans of frames looking for tell tale signs of digital manipulation. It is not there! The images appear as a real video should. No high resolution digital choppiness! 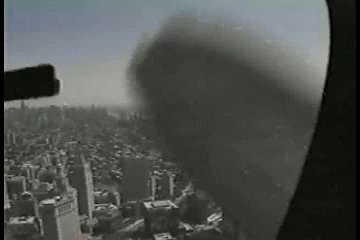 The clip starts off PRE 911 with a panaromic view of New York City and the Twin Towers from a helicopter. A woman points to the towers and says what's that. 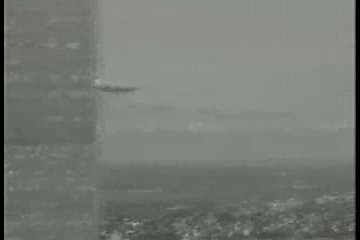 A UFO is clearly seen peeking in and out from behind the WTC at the exact spot the second plane would later crash into on 911! When the cameraman zooms in, the UFO takes off at an incredible speed. A few seconds goes by and the camera refocuses in on the UFO at a far distance. The UFO then does a 360o reverse! It heads right for the helicopter and a CLOSE UP of the UFO is taken by the video camera! The UFO then quickly zooms above the helicopter and right into orbit! We have a link below to the Sci Fi .mov file. We have a full version in high quality .rm below with sound. First some photos from the videos. You can see the WTC clearly in this photo. You can see a UFO hiding behind the WTC in this photo. The UFO starts to move away from the WTC. Here is the CLOSE UP of this amazing UFO! The usual skeptics are calling this a hoax. We have analyzed FRAME BY FRAME it is real in our opinion. A few lies the skeptics say about this video. I asked the world famous psychic Sollog about this video. He says it is REAL! He says it was humans from a horrific FUTURE trying to give us a message about 911! A message about DON'T START WORLD WAR III over 911! If the USA attacks Iraq, then NUKE TERRORISM will be used on the West and the future will be a horrific nuclear war within a generation! Then humans are reduced to what most now consider aliens! They are deformed in appearance and very highly technologically advanced beings. Beings that have no future! That is why they now come back through time! To when THE END started! Sollog predicted exact details of 911 so clearly the FBI came to our publishers office and investigated him over his warning! Analysis of WTC Video - See what an EXPERT Special Effects person says about the WTC UFO Video! Since some morons are quoting this article to criticize Sollog, I am updating this piece with my notes from my quick interview with Sollog about this video. My Sollog quote was taken from his statement, "Based on experts I have discussed this video with, the opinion is THE VIDEO IS REAL!" So I took the most important part of the statement and used it. That is what reporters do, they select parts of interviews in such use. After that interview, Real UFOS did a piece on this video quoting the expert Sollog referred to. His opinion was it was real unless a major studio created it. It was not a simple hoax from a private person. See the Expert Analysis Article above. Since these articles were written a woman claiming to have been in the video says it was a commercial created for SciFi which was owned by Universal Studios at the time it was released to the public. Since then, SciFi and Universal Studios have REFUSED to declare if the video was CGI (Computer Generated Imaging) or real. So what Sollog fully stated needs to be put into context now, he stated experts had declared it was REAL or a great piece of work done by a major studio. In Sollog's Book UFOS THE PROOF, he puts forth many such famous UFOS sightings as PROOF that famous sightings often appear where great tragedies will soon occur. It is Sollog's argument that repeated famous UFO Sightings happening where major tragedies occur are SIGNS. There is another famous UFO video connected to the World Trade Center that is presented in Sollog's book. A plasma craft. So at the time of this original article there were thought to be TWO MAJOR UFO VIDEOS connected to the World Trade Center before 911 occurred. Like Sollog stated in his book and in my interview, it is clear a message about 911 was given by UFOS at the WTC. The plasma UFO night video at the WTC was a SIGN. If this daytime UFO is fake, then SciFi should clear up the debate. Like the expert stated in the article that was linked to originally, if this is a FAKE it was done by a major studio. So now you have the complete comment by Sollog, he had access to opinions by experts it was REAL, he has other WTC Video that proves his point, famous UFO sightings often occur where major tragedy will occur. AN expert said it was not done by an amateur, it was real UNLESS a major studio was involved. If it was a hoax, why isn't SciFi admitting it?